4. What is necessary to perform (implement) in the class that implements the specified interface? 6. Is it possible to create an instance (object) of the interface? 7. How many classes can the interface be implemented in? 8. How many interfaces can one class implement? 9. What type of access must have methods declared in the interface? 10. What the default access type have methods declared in the interface? 11. How to invoke class methods using references to interfaces? 13. In what cases, you can use the public access specifier in interface declaration? 14. 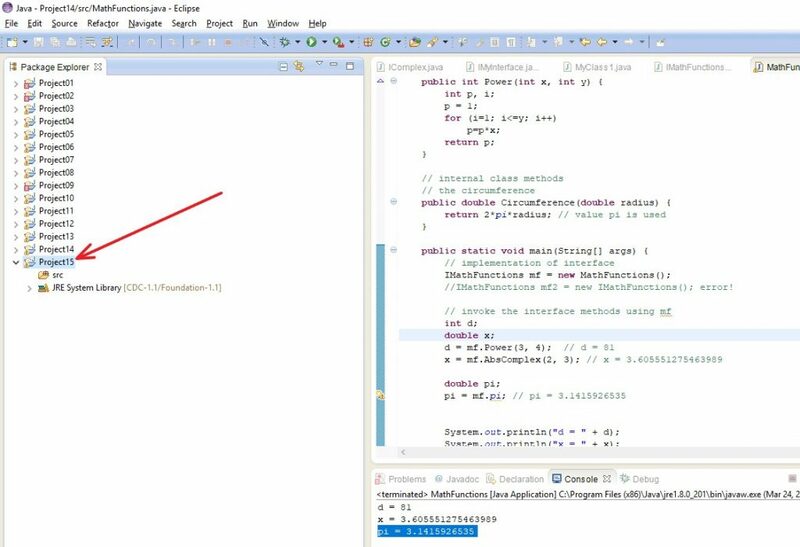 How to add an interface declaration in Java Eclipse? Interfaces are used to create completely abstract classes that contain no implementation at all. Interfaces do not contain an implementation. Thus, interfaces are intended to describe what can be implemented by classes that implement these interfaces. In other words, interfaces indicate, which can be implemented, but not how it should be implemented. Interfaces describe the form and not the implementation. The interface contains the names of the methods, argument lists, and the types of values that are returned, but not the implementations of these methods. interfaces allow to partially implement the so-called “multiple inheritance”, which was implemented in C++. var_name1, var_name2, var_nameN – variables names that are declared in the interface. Any variable declared in the interface, is declared with final and static modifiers. This variable must be initialized. In a class that implements an interface, you cannot change the value of a variable. here SomeClass – the name of the class that implements the SomeInterface interface. in the class it is forbidden to change the values of variables declared in the interface. use of an interface reference to access methods. mathematical function AbsComplex(), which returns the module of a complex number. After the interface is declared, a class is declared that must implement the methods of this interface. In our case, the MathFunctions class is declared. In the above code, the mf link to the IMathFunctions interface is first declared. Then for this mf link, an instance of the MathFuncions class is created. This implementation works because the MathFunctions class implements the IMathFunctions interface. Using the mf link, you can invoke the interface methods. method ConvertOdd(), which returns a string consisting of characters lying on odd positions. The ProcessStrings class implements the IStrings interface. Since the interface contains only the declaration without implementation, it is prohibited to create an instance of the interface. However, a link to the interface can be announced. But when allocating memory with the operator new, the class constructor that implements this interface must be specified. The interface can be implemented in any number of classes. For example, in the following code, two different classes with the names SomeClass1, SomeClass2 implement one interface SomeInterface. the class named ClassName implements interfaces named Interface1, Interface2, Interface3. Methods declared in the interface must be public, that is, they must be of public access type. both methods method1() and method2() have public access. Allocate memory for reference by specifying the class constructor that implements the interface. Invoke methods or variables declared in the interface. It is possible to declare a variable in the interface. Any variable declared implicitly in the interface is declared with final and static modifiers. This variable must be initialized. In a class that implements an interface, you cannot change the value of a variable. The public access specifier can be used before the interface name only when the interface is defined in a file that has the same name. If the interface name does not match the file name, then the public specifier cannot be used in the interface declaration. For example. A file named IMyInterface.java is specified. In this file, you can declare a public interface with the same name. In systems that support Java programming, the addition of interfaces to a project is implemented using special commands. 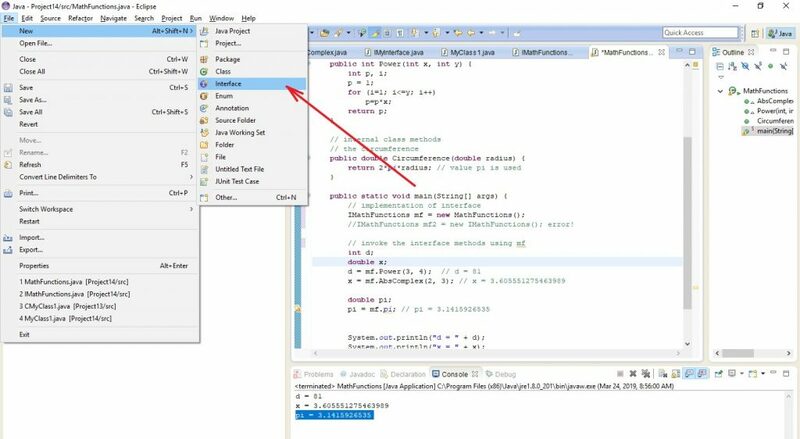 To add an interface to a project in a Java Eclipse programming system, follow these steps. 1. Activate the project to which you want to add an interface (Figure 1). 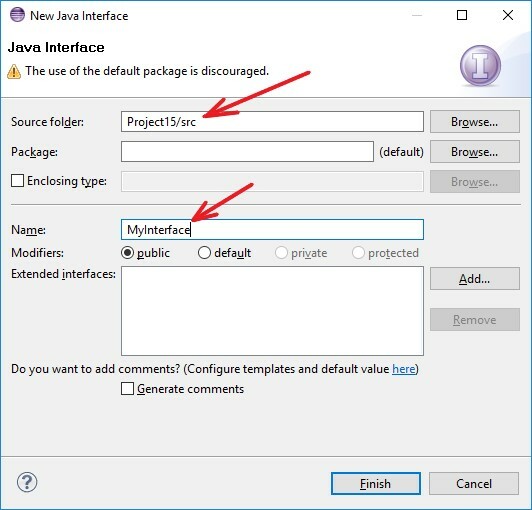 As a result, the “New Java Interface” window will open (Figure 3). in the field “Name:” you need to specify the name of the interface, for example, MyInterface. 4. After selecting the Finish button, the interface named MyInterface will be added to the Project 15 project as shown in Figure 4. 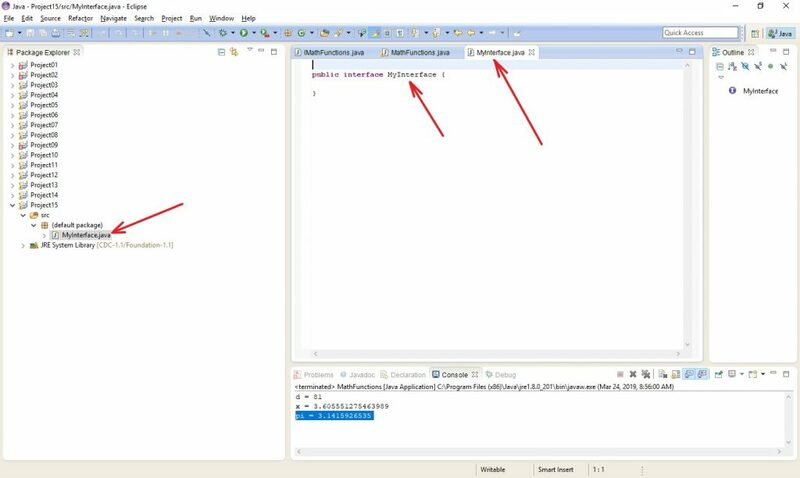 For the interface, a separate file MyInterface.java is created. Apparently, the interface file name and interface name are the same. Also, the interface is declared as public in order to be accessible from other files, packages.